Obama's focus on special ops and secret drone wars open the door to an imperial presidency with no accountability. Boston, MA - As he campaigns for reelection, President Obama periodically reminds audiences of his success in terminating the deeply unpopular Iraq War. With fingers crossed for luck, he vows to do the same with the equally unpopular war in Afghanistan. If not exactly a peacemaker, our Nobel Peace Prize-winning president can (with some justification) at least claim credit for being a war-ender. "Since 9/11, USSOCOM's budget has quadrupled... [Obama's] essential contribution has been to broaden the special ops mandate. As one observer put it, the Obama White House let Special Operations Command 'off the leash'." President Franklin Roosevelt may not have invented the airplane, but during World War II he transformed strategic bombing into one of the principal emblems of the reigning American way of war. General Dwight D Eisenhower had nothing to do with the Manhattan Project that developed the atomic bomb. Yet, as president, Ike's strategy of Massive Retaliation made nukes the centrepiece of US national security policy. So, too, with Barack Obama and special operations forces. The US Special Operations Command (USSOCOM) with its constituent operating forces - Green Berets, Army Rangers, Navy SEALs and the like - predated his presidency by decades. Yet it is only on Obama's watch that these secret warriors have reached the pinnacle of the US military's prestige hierarchy. John F Kennedy famously gave the Green Berets their distinctive headgear. Obama has endowed the whole special operations "community" with something less decorative but far more important: privileged status that provides special operators with maximum autonomy while insulating them from the vagaries of politics, budgetary or otherwise. Congress may yet require the Pentagon to undertake some (very modest) belt-tightening, but one thing's for sure: no one is going to tell USSOCOM to go on a diet. What the special ops types want, they will get, with few questions asked - and virtually none of those few posed in public. Since 9/11, USSOCOM's budget has quadrupled. The special operations order of battle has expanded accordingly. At present, there are an estimated 66,000 uniformed and civilian personnel on the rolls, a doubling in size since 2001 with further growth projected. Yet this expansion had already begun under Obama's predecessor. His essential contribution has been to broaden the special ops mandate. As one observer put it, the Obama White House let Special Operations Command "off the leash". As a consequence, USSOCOM assets today go more places and undertake more missions while enjoying greater freedom of action than ever before. After a decade in which Iraq and Afghanistan absorbed the lion's share of the attention, hitherto neglected swaths of Africa, Asia and Latin America are receiving greater scrutiny. Already operating in dozens of countries around the world - as many as 120 by the end of this year - special operators engage in activities that range from reconnaissance and counterterrorism to humanitarian assistance and "direct action". The traditional motto of the Army special forces is "De Oppresso Liber" ("To Free the Oppressed"). A more apt slogan for special operations forces as a whole might be "Coming soon to a Third World country near you!" The displacement of conventional forces by special operations forces as the preferred US military instrument - the "force of choice" according to the head of USSOCOM, Admiral William McRaven - marks the completion of a decades-long cultural repositioning of the American soldier. 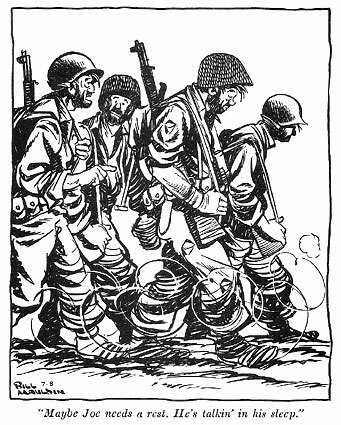 The GI, once represented by the likes of cartoonist Bill Mauldin's iconic Willie and Joe, is no more, his place taken by today's elite warrior professional. Mauldin's creations were heroes, but not superheroes. The nameless, lionised SEALs who killed Osama bin Laden are flesh-and blood Avengers. Willie and Joe were "us". SEALs are anything but "us". They occupy a pedestal well above mere mortals. Couch potato America stands in awe of their skill and bravery. This cultural transformation has important political implications. It represents the ultimate manifestation of the abyss now separating the military and society. Nominally bemoaned by some, including former Secretary of Defense Robert Gates and former Joint Chiefs Chairman Admiral Mike Mullen, this civilian-military gap has only grown over the course of decades and is now widely accepted as the norm. As one consequence, the American people have forfeited owner's rights over their army, having less control over the employment of US forces than New Yorkers have over the management of the Knicks or Yankees. As admiring spectators, we may take at face value the testimony of experts (even if such testimony is seldom disinterested) who assure us that the SEALs, Rangers, Green Berets, etc. are the best of the best, and that they stand ready to deploy at a moment's notice so that Americans can sleep soundly in their beds. If the United States is indeed engaged, as Admiral McRaven has said, in "a generational struggle", we will surely want these guys in our corner. Autonomy and accountability exist in inverse proportion to one another. Indulge the former and kiss the latter goodbye. In practice, the only thing the public knows about special ops activities is what the national security apparatus chooses to reveal. Can you rely on those who speak for that apparatus in Washington to tell the truth? No more than you can rely on JPMorgan Chase to manage your money prudently. Granted, out there in the field, most troops will do the right thing most of the time. On occasion, however, even members of an elite force will stray off the straight-and-narrow. (Until just a few weeks ago, most Americans considered White House Secret Service agents part of an elite force.) Americans have a strong inclination to trust the military. Yet as a famous Republican once said: trust but verify. There's no verifying things that remain secret. Unleashing USSOCOM is a recipe for mischief. "With special ops, no such notification or consultation is necessary; the president and his minions have a free hand." From a president's point of view, one of the appealing things about special forces is that he can send them wherever he wants to do whatever he directs. There's no need to ask permission or to explain. Employing USSOCOM as your own private military means never having to say you're sorry. When President Clinton intervened in Bosnia or Kosovo, when President Bush invaded Afghanistan and Iraq, they at least went on television to clue the rest of us in. However perfunctory the consultations may have been, the White House at least talked things over with the leaders on Capitol Hill. Once in a while, members of Congress even cast votes to indicate approval or disapproval of some military action. With special ops, no such notification or consultation is necessary; the president and his minions have a free hand. Building on the precedents set by Obama, stupid and reckless presidents will enjoy this prerogative no less than shrewd and well-intentioned ones. As US special ops forces roam the world slaying evildoers, the famous question posed by David Petraeus as the invasion of Iraq began - "Tell me how this ends" - rises to the level of Talmudic conundrum. There are certainly plenty of evildoers who wish us ill (primarily but not necessarily in the Greater Middle East). How many will USSOCOM have to liquidate before the job is done? Answering that question becomes all the more difficult given that some of the killing has the effect of adding new recruits to the ranks of the non-well-wishers. In short, handing war to the special operators severs an already too tenuous link between war and politics; it becomes war for its own sake. Remember George W Bush's "Global War on Terror"? Actually, his war was never truly global. War waged in a special-operations-first world just might become truly global - and never-ending. In that case, Admiral McRaven's "generational struggle" is likely to become a self-fulfilling prophecy. Andrew J Bacevich is professor of history and international relations at Boston University and a TomDispatch regular. He is editor of the new book The Short American Century, just published by Harvard University Press. To listen to Timothy MacBain's latest Tomcast audio interview in which Bacevich discusses what we don't know about special operations forces, click here or download it to your iPod here. A version of this article was first appeared on TomDispatch.com.